Our local surf fishing report: Not much to report in the last few weeks since a series of huge pacific storms can ashore in Southern California. With that said, there has been some decent perch fishing with some of the larger fish coming from South OC and the Malibu area. Perch have been caught on the usual baits such as sand crabs and grubs with some of the largest fish coming on sidewinder (lined shore) crabs. Halibut fishing has also been good and although there has not been any huge fish reported several legal fish have been landed from Santa Barbara to San Diego. Most of the bigger halibut have been caught with a Rapalla/Lucky Craft or on sardine/smelt colored swim baits. I guess the biggest news on the surf front has to be the numerous stripers that have been landed. We’ve seen fish come from Santa Monica, Palos Verdes, Long Beach and Orange County. 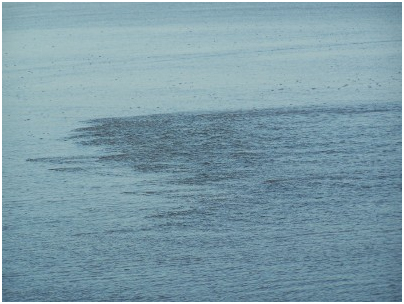 The pattern of stripers biting after a rain storm is not unusual and is something we often see after heavy rains that flush cold fresh water into the ocean. Stripers commonly bite bright flashing lures like Kastmaster and Krocodiles but some recently have come on grubs too. Next week promises some great tides and calm, warm weather. Now that the storms have settled down (for the time being) I guarantee the fishing on next week’s astronomical tides should be great. So look for our next report or just see me on the beach!! If there’s one bait that gets the job done in summer it’s the sand crab. From the months of May through September large numbers of crabs come to the surface and become the perfect bait for surf fish. Crabs can be caught at both high and low tide. I find them most numerous at high tide and prefer to search for them then. It’s productive to dig, scoop or rake crabs in an area within 10 feet of the high tide mark. Once the ocean temperature gets to 60 degrees sand crabs come to the surface to feed and spawn. This is when they gather is large groups and are most easily caught. Crab beds are easy to spot as the waves wash over them. Look for areas where the sand seems rough and the water ripples as it recedes. This is where crabs live, just below the surface of the sand. You may dig them by had or use a hand held sifter. I like to use a sand crab rake because it covers a larger area and gives me a better variety of bait. 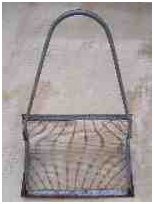 Crab rakes cost about $50.00 and can be found at many local tackle shops. No matter what you use for digging crabs be sure to rinse your equipment in fresh water once you get home from the beach. 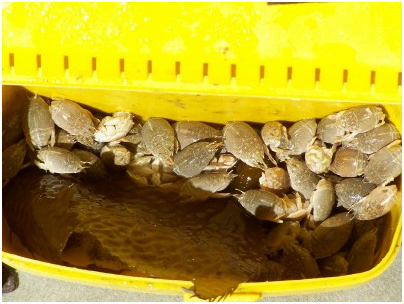 As you catch crabs put them in a waist bait bucket or a plastic container that has no water or sand inside. Rinse the crabs to remove as much sand as possible and use a small piece of wet kelp to keep them moist and cool. You are looking especially for crabs whose shell is pliable (about as hard as a soda can) and in several sizes. If you’re catching crabs for fishing tomorrow or just have some left over you can keep them for a few days in a cool dry place. Don’t keep crabs in salt water or in the refrigerator, as they will die in just a few hours. My favorite way is to keep the bait in a plastic container with a piece of wet kelp or newspaper over them. I then keep that container in an ice chest with a frozen bottle of water nearby to keep them cool. Now that we know how to catch and keep sand crabs our next step is how to rig and hook this bait. I always use two rules when it comes to live bait. Rule number one: Always match your bait to what fish are eating around you. If you see crabs in the sand or mussel on the rock you know that’s what the fish are eating too. Second: Match you bait closely with hook size and hook your bait so its presentation is as natural as possible. Start by grabbing a sand crab between your thumb and forefinger. Insert the hook in the top near the back end of the crab. Push the hook all the way through the crab and then twist the hook so its point is facing forward. Push the hook back up through the crab just barely exiting the hook back out the top of the crab’s head. This hooking method provides one of the most natural presentations and allows the bait to look as if it’s scurrying across the bottom. Another method is to put more than one crab on a hook. I call this the “smorgasbord”. It sometimes works better than a single crab (especially when crabs are small). I like to put the hook directly through the middle of the crabs back and make one crab look like it’s right on the back of another. If bites get rare alternate these different presentations and see what happens. You may be surprised. Now that we know how to hook crabs it’s time to set up our rod with the correct rig. I like to use a 7-8’ rod rated 4-12lb test (much like the trout rod you now have in your garage). I match this rod with a 2000-3000 size-spinning reel with 4 or 6lb test. Once rod and reel are matched, I tie the Carolina rig to my rod. 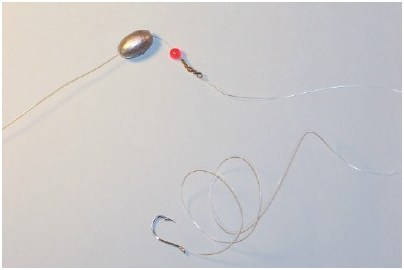 The Carolina rig is nothing more than a sliding egg sinker, a bead, a swivel, about 18-36” leader and a hook. My hooks of choice are split shot thin wire hooks. Octopus and mosquito hooks also work well. The real secret to catching fish is hooking them–that’s why thin, sharp wire hooks are a must. The last chapter in our search for fishing the sand crab is where on the beach to start fishing. Remember, crabs are churned up in frothing surf and this is where the fish find them. Stay away from clear water and look for areas where the water is churned up, moving and covered in froth or foam from the breaking waves. Moving water can be found near rip tides, in inshore troughs and around jetties. Fish the edges of these rough turbid areas and you’ll probably find fish. Each time you visit the beach try to pay attention to the conditions and how they affect your fishing luck. Even though you can’t be guaranteed to catch fish at least you’ll have learned something new that’s sure to give you better luck the next time you hit the surf. Our tackle shop has all the rigging you’ll need for the beach–so check it out! Hip bait bucket, rigging and surf fishing tackle. You’ll find all kinds or great information at www.fishthesurf.com about how to become a better surf fisherman. We have live beach web cams, tide charts, how-to articles, pictures, rigging, and much more.